Known as the Killer, Jerry Lee Lewis is rock music's first great wild man. He is known for both his extraordinary talent and his extraordinarily troubled personal life. Although he has earned a place among music royalty, his career suffered greatly through scandal. 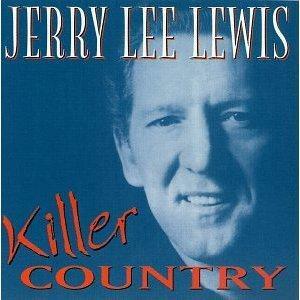 Jerry Lee Lewis was born in Ferriday, Louisiana on September 29, 1935 to Elmo and Marnie Lewis. As a child he started to learn piano alongside his two cousins, future country music star Mickey Gilley and future televangelist Jimmy Swaggart. Lewis' talent was apparent, and his parents took out a loan against their farm to buy him his own piano. Lewis' childhood was spent immersed in a host of southern music, from gospel to country to boogie woogie and the emerging rhythm and blues scene. All of these sounds appeared in his own music throughout the years. Lewis' parents were supportive of his interest in music, but they were convinced he should dedicate himself to playing religious music. As such, they sent him to Texas' Southern Assembly of God University. Lewis got kicked out shortly after arriving for performing a boogie woogie version of the spiritual My God is Real. After leaving the school, Lewis turned his back on performing gospel music. Lewis performed on the Deep South club circuit and made a failed attempt to land a spot on the Grand Ole Opry. Every music industry insider he met told him he could never be a star while playing the piano. Everything changed, however, when he paid a visit to the legendary Sun Studios in Memphis. Lewis was signed to a deal with Sun in 1956. While playing piano as a studio musician, he also began to record his own material. His piano work on songs by some of his Sun label mates, including Carl Perkins and Johnny Cash, helped pave the way for a new rockabilly sound featuring piano that allowed Lewis to become a star in his own right. On the back of the hits Whole Lotta Shakin' Goin' On and Great Balls of Fire, Lewis became a celebrity. He also started gaining a reputation for wild behavior. He frequently stood on his piano while he played, and one story that has become music industry folklore recalls Lewis setting his piano on fire during a show because he was angry that Chuck Berry was billed higher than him. The Killer was on top of the world, but scandal nearly cost him everything. In the late 1950s, Lewis had a reputation for unpredictability but he was also a much-loved performer. His handlers worked overtime trying to conceal his private life from the media glare. They lost their firm grip on his reputation in 1958, when Lewis traveled to the U.K. for his first international promo tour. A lone journalist showed up at the airport to greet him and encountered Lewis' new wife: his 13-year-old cousin, Myra Gale Brown. When the news broke, Lewis was virtually run out of the U.K. and returned home to the U.S. to equally negative press. It took him well over a decade to recover, and he never quite reached the same level of stardom again. Jerry Lee Lewis' life took a major turn after the Myra Brown scandal. He tried unsuccessfully to relaunch his career throughout the 1960s. His fortunes finally turned in the early 1970s when he recast himself as a country artist. By the early 1980s, Lewis' music career was largely over, but he experienced resurgences in popularity on occasion. The 1989 biographical film Great Balls of Fire! introduced his music to a new generation. In 1993 the box set All Killer, No Filler was released, giving Lewis' fans a solid representational collection of the music he had made over the years. Rolling Stone Magazine honored the album with a place on its list of the 500 greatest albums of all time. In 2006, Lewis released Last Man Standing, a collection of duets with other famous artists. Its name derives from the fact that Lewis is the last of the great Sun Studios recording artists from the 1950s who is still alive. The album was well-received and peaked at number 26 on the U.S. Billboard 200. Lewis released the follow-up album, Mean Old Man, in 2010. This album also performed well, cracking the top 100 U.S. albums and winning praise from fans and music critics. 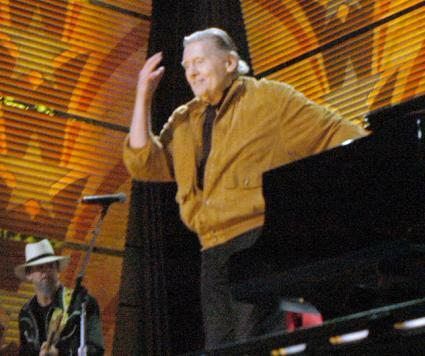 Jerry Lee Lewis still performs live from time to time. In 1999, he was part of a gala put on by the Smithsonian Institution to celebrate 300 years of the piano. In 2008, he performed two of his greatest hits, Good Golly Miss Molly and Great Balls of Fire, alongside John Fogerty and Little Richard at the Grammy Awards ceremony. In 2009, Lewis had his biggest show in decades when he opened the Rock and Roll Hall of Fame 25th anniversary concert. He had been one of the Rock and Roll Hall of Fame's very first inductees. Downloading music is simple and easy, and it's hard to imagine a better way to build a great music collection. You will discover an extensive library of tunes by Jerry Lee Lewis on the Internet Archive's Community Audio Channel. Choose from over 100 songs, arranged in alphabetical order for easy searching and browsing. Jerry Lee Lewis' appeal can truly be called timeless. The year 2009 marked 60 years since his first public performance of Drinking Wine Spo-Dee-O-Dee at a Ford dealership in his hometown of Ferriday, Louisiana in 1949. Throughout those six decades, Jerry Lee Lewis has played his heart out and kept his music alive through immense talent and determination, ensuring his permanent place as a rock and roll legend.